Note that the Analytics Edge connector will automatically provide the “&filters=” prefix — do not include it in your filter expression. The prefix has been removed from this document to avoid confusion. The same expression with work with both the v3 API and the v4 API, but there are some subtle differences. 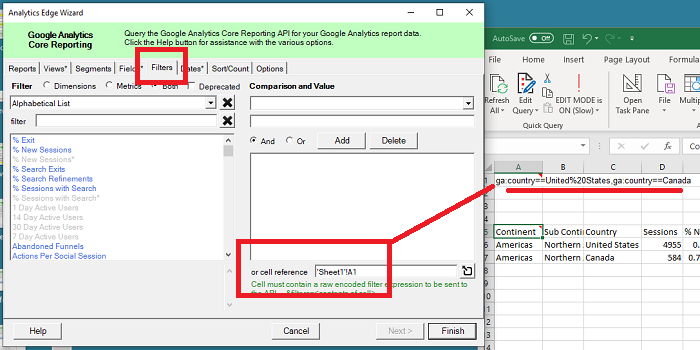 The Analytics Edge connectors will automatically adjust for those differences for you [the Free Google Analytics connector uses the v3 API; the Google Analytics Pro connector uses the v4 API]. Filtered queries restrict the rows that do (or do not) get included in the result. Each row in the result is tested against the filter: if the filter matches, the row is retained and if it doesn’t match, the row is dropped. URL Encoding: The Google API client libraries automatically encode the filter operators. Valid combinations: You can filter for a dimension or metric that is not part of your query, provided all dimensions/metrics in the request and the filter are valid combinations. For example, you might want to query for a dated list of pageviews, filtering on a particular browser. See the Dimensions and Metrics Reference for more information. name — the name of the dimension or metric to filter on. For example: ga:pageviews filters on the pageviews metric. expression — states the values to be included in or excluded from the results. Expressions use regular expression syntax. There are six filter operators for dimensions and six filter operators for metrics. The operators must be URL-encoded in order to be included in URL query strings. Maximum length of 128 characters — Regular expressions longer than 128 characters result in a 400 Bad Request status code returned from the server. This entry was posted in Google Analytics on 2019/03/27 by mike_sullivan.